I've already published my Stocking Fillers Gift Guide which went down really well so today's post is my roundup of a selection of gifts for him, whether's that is your brother, dad, husband, cousins or friends so I hope you like the gifts and this post gives you some ideas for this christmas season...I want to keep all of these for myself to be honest though. The first gift is one of my favourites and I've been using it so much! 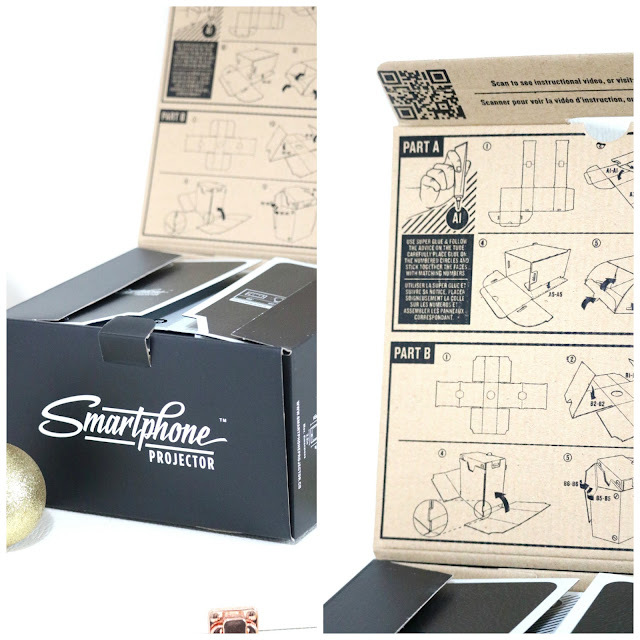 It's a cardboard smartphone projector which is perfect for the colder months as you can have a cosy movie day in bed! The projector is suitable for use with all iOS and Android smartphones so it should work with all iPhones (I have an iPhone 5C and it fits well). It comes with instructions printed onto the box and it is a little time consuming to put together *I'm more used to putting together Ikea wardrobes...* and it takes a while to get the distance/set up right but it is a little DIY project on Christmas day and will mean that you can watch movies and embarrassing christmas home movies over Christmas Day and Boxing Day instead of the awful TV! Last year I only read about six or so books but this year my goal was 30 which seemed almost insurmountable at the time but I'm now on my 72nd book which I'm really proud of and one of the publishers that I've loved is Pushkin Press; their books are beautifully published and so unique! So I obviously have a few books in my gift guides this year as I think books can make lovely gifts. First up, these two incredibly beautiful books from Pushkin Press, *Triumph and Disaster and *Genius and Discovery by Stefan Zweig (£9.99 each). I have to be honest and say that book covers definitely affect my interest and catch my attention and I think it's important for Christmas gifts to look the part. I adore the metallic, foil detailing on the books, especially the copper shade *heart eyes emoji*. These dramatised historical studies of some of the most poignant moments in history are so interesting and will make a unique Christmas gift or stocking filler. I'll have full reviews next month or in the New Year (my current TBR is huge!). 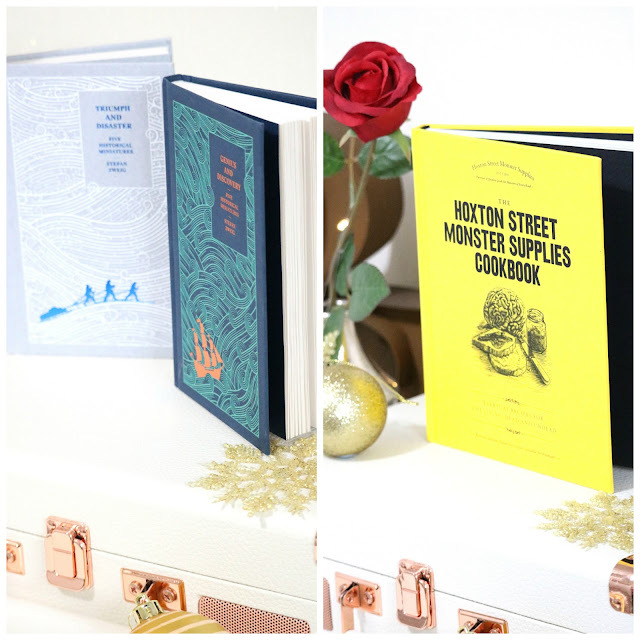 The majority of the people in my life love food, baking and cooking so cookbooks are great and safe gifts to give; however they can get a little repetitive but in comes Hoxton Street Monster Supplies to the rescue...you can probably tell by the store name that this isn't your usual cookbook. The Hoxton Street Monster Supplies Cookbook (£13) is a unique cookbook designed for the living, dead and undead alike, it's full of interesting halloween and monster filled recipes such as Classic Kraken Crumble, Boiled Bile Jam, Dragon's Egg Tarts and so many more amazingly macabre recipes - I love it! Also I adore the illustrations, cover and it's a fantastic price; there are so many stocking fillers on their site too and I want them all! My dad is awful to buy for, he's so picky with everything so I always just end up buying him aftershave which he likes but it's not very interesting so I think this gift set from Crabtree and Evelyn will be the answer! The *Crabtree and Evelyn Indian Sandalwood Traveller Gift Set (£24) contains travel sizes of their hair and body wash, shave cream, after shave balm and cologne in the heavenly 'indian sandalwood' scent. I adore the scent, it's woody, masculine and musky but it's different to all of the generic men's scents. It's presented so nicely and it would make a perfect Christmas gift for dads, brothers, friends and the men in your life who travel. I think for most men, skincare and grooming products on the whole are a little confusing or feminine and I know my dad wouldn't know what to buy so I'm always the one to choose products for him and he does actually use them. The Chambers & Co Balm For Active Feet (£8, 60ml) which is perfect for dry skin. It contains carrot oil, hemps seed oil, vitamin E and more fantastic, natural ingredients. The *Chambers & Co Balm For Active Hands (£8, 60ml) also contains great ingredients such as aloe vera, coconut oil and almond oil. Both would be fantastic as men's or womens stocking fillers or as part of a hamper - perfect for this time of the year when your skin needs a little TLC. Food is also a go-to gift but it's usually chocolate, coffee or hot chocolate but this is much more unique but just as practical and yummy! The *Easiyo Yoghurt Maker (around £18) is a quick and easy to use yoghurt maker that uses packet mixes (£2 each) which makes up to 1kg of yogurt per packet. I have the 'forrest fruit' and 'greek style with honey' flavours, the first is amazing. 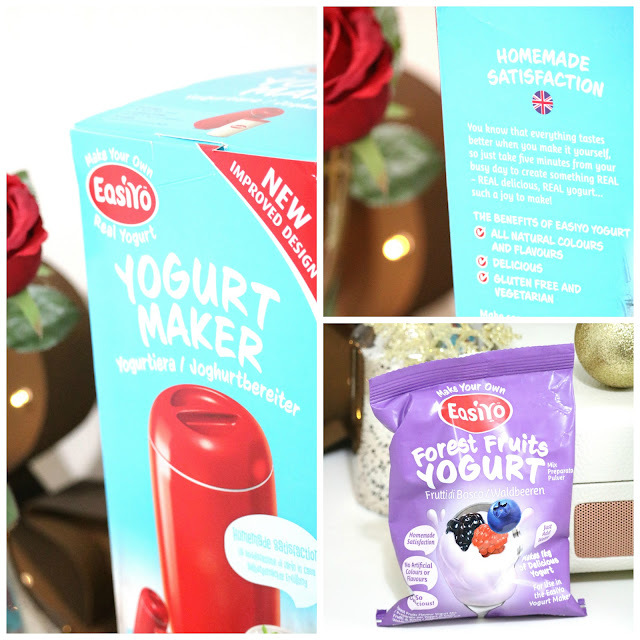 The yogurt maker is so simple to use and you can have smooth, creamy and delicious yogurt in between 8 to 24 hours depending on how quickly it sets. I think it would make a great family gift as it's something parents/guardians and children could make together! There are also so many yoghurt flavours to choose from and they're vegetarian, gluten free and contain natural flavours and colours. This final gift is probably my personal favourite and all of my friends, family and neighbours that have tried it have loved it too so it would be perfect for share the experience with over the Christmas season, parties and New Year! 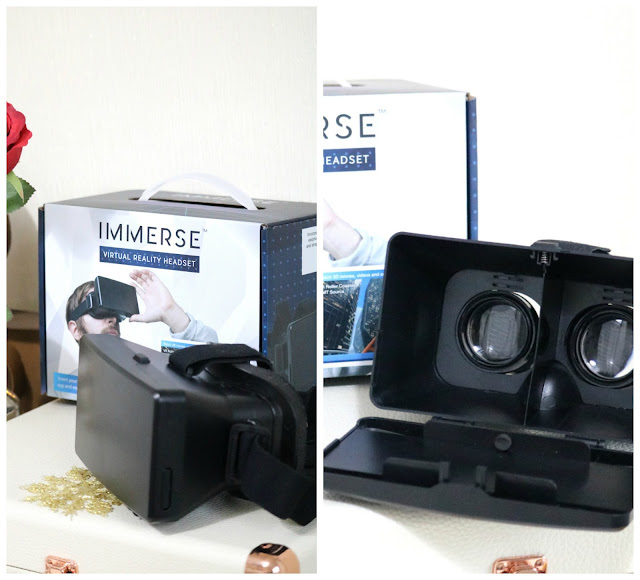 The *Immerse Virtual Reality Headset (£39.99) is a virtual reality headset in which you place your smartphone and you can play and explore virtual worlds (via free apps you can download from the app store) as well as 3D movies and videos. I've downloaded a few apps and the best so far have to be the Jurassic VR and Haunted Rollercoaster apps - the jurassic one is amazing as you are in a jurassic park like environment with dinosaurs roaming around! The headset is so easy to use and I love the experience of virtual reality; the only negative I have is that the headset is a little heavy with a phone in it and there aren't a tonne of apps right now but I'm sure that will change soon. My grandad, aunties, friends, parents and neighbours all loved it, it's a great talking point and everyone wants to try it (they're all impressed by it!). What do you think of the items in my gift guide? Have you done your Christmas shopping yet? Love these gift ideas! The Yogurt maker sounds amazing, thanks for sharing! Some great ideas! I'm struggling to think of what to buy my BF, but I recon he'd absolutely love that yoghurt maker! the headset is such a cool idea and not at all expensive as I thought it would be! great ideas, men are always so hard to shop for! Oh my gosh, buying guys presents is SO hard! These look like great gifts! I thought the virtual reality headset would be much more expensive! LOOOOVELY ideas, thanks so much for sharing. Girl, thanks for sharing this men's gift guide, because buying guys presents is not easy. I'm always have trouble trying to find a good present for them. So I'm happy to find your guide. The yogurt maker sounds incredible! I've never seen something like that in the market. The virtual reality headset looks like it would be every mans dream. Great picks! I always struggle to buy gifts for guys.